For most people, illness is temporary and can be treated with a visit to the clinic or a hospital stay. For others, however, medical and personal care is a 24/7 need. 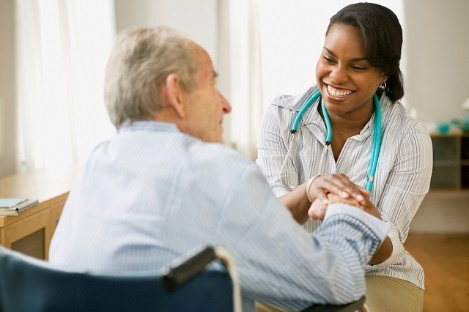 In these cases, many individuals turn to the professional help of a home health aide. A home health aide is a trained caretaker that works with a patient in his or her own home, helps them with daily tasks that they are no longer able to do alone, assists with routine care (grooming, dressing, brushing teeth, etc. ), administers prescribed medications, monitors their condition, and generally builds a bond with the patient to help them heal and/or stay mentally and emotionally healthy. Because of the intense level of care involved, there is a strong emotional element to the job. In fact, many home health aides can become as close to patients as family members. Depending on a patient’s age, medical conditions, and/or physical or mental ability, he or she may require a specialized kind of home health aide. Take a look at a few of the different options for home health aides to determine which might be right for you or your loved one. As we age, our bodies naturally tend to weaken physically and become more susceptible to illness. For some elderly individuals, genetics, aging, and lifelong exposure to certain environmental factors can lead to an inability to care for oneself sufficiently. A home health aide for the elderly will focus on maintaining a healthy routine of personal care, providing meals, administering medications, providing emotional support, and helping the patient maintain some feeling of independence and control. Those with physical disabilities like paralysis, cerebral palsy, muscular dystrophy, or loss of limbs have specialized needs that can make everyday activities difficult to accomplish alone. Home health aides working with patients who have physical disabilities provide assistance with daily tasks and personal care (including cooking, dressing, bathing, etc. ), assist with any prescribed daily physical therapy/exercise, help patients put on and learn to walk with prosthetics, and/or help them get in and out of wheelchairs or other vehicles. The job duties of HHAs who work with patients that have cognitive impairments can vary dramatically on a case-by-case basis. Depending on the limitations created by the patient’s cognitive impairment, a home health aide may have to find unique ways of communicating and performing regular tasks. In general, home health aides working with the cognitively impaired provide the same kinds of support as they would with the physically disabled or the elderly: assisting with personal care tasks, administering prescribed medications, providing emotional and mental support and more. If you’re not a patient but have an interest in becoming a home health aide, ABC Training Center offers the courses you need to get started. To learn more about our home health aide training in NYC, contact us today at (718) 618-5589.